Size Matters- Does Anyone Still Care About the 12.9″ iPad Pro? When the 12.9″ iPad Pro was released in November of 2015, it definitely caused a bit of a stir. A device with a larger screen than many laptops, new multitasking features, and advanced stylus support demanded that we rethink what the iPad was and what it could be. Considering that the momentum had last swung in the opposite direction with the release of the iPad Mini and its successors, the iPad Pro was a definite departure from the norm. I’m pretty sure that is exactly what Apple wanted at the time. However, as time has gone on, we have gotten a 9.7″ version of the Pro that seems to have taken the spotlight off of the original device. We also can’t ignore the fact that iPad sales have been in continuous decline since before the 12.9″ Pro was released, and that we may soon have a new device with an in-between screen size. Has Apple lost interest in the original Pro, or is it possible that they think (or research is telling them) that it is just too big? All that said, I’m wondering where the 12.9″ iPad Pro fits into the lineup now. I understand that it is a LARGE device and it obviously isn’t as portable as the 9.7″ Pro, especially when you put them both in cases. However, there really is something to be said for a mobile device with enough screen real estate to easily multitask on, or run Duet and turn it into a very usable secondary monitor. The big boy can handle some things that smaller iPads will struggle with. As for my own experience, I have stuck with the 12.9″, even after taking a hard look at the 9.7 when it was released. It really fits the way I want to use the device now. I have the iPhone 7 Plus, so I’ve got a pretty good size screen on my phone, and it goes everywhere that I do. I don’t need the iPad to fill those kinds of roles. I use mine as a hybrid computer, especially for various tasks at work. My Pro gets a lot of run as a video player, and it is really hard to beat in that regard. I spend a fair amount of time on the road for work, so it is very handy having a big screen Netflix player with great speakers with me. My work laptop is pretty much all business, all the time, and I like it that way. I actually prefer to have a separate larger device for my personal use, and the Pro takes care of what I need to do effectively. I also use my Pro as a second screen quite a bit on the road, whether connected to my laptop via Duet, or just as a document viewer and email machine so I can keep my laptop focused on a specific work task. In both of these use cases, the larger size actually works in my favor more than the size and added weight work against me. A fast growing use case for me is what I am doing right at this moment- writing. I have used various Bluetooth keyboards and keyboard cases with my past iPads and used to do a lot of blog post drafting in the past. However, that was about the extent of what I could do with an iPad at that time. These days I alternate between a ZAGG Slimbook keyboard case and a more traditional case/stand with a full-sized but portable Logitech K811 Bluetooth keyboard. These keyboards paired with the WordPress app have become my weapon of choice for all of my personal writing, and even some of work. All but one of the articles I have posted here and at iPad Insight have been written, edited, and published using only my Pro. With the right keyboard, this size iPad Pro is just a killer writing machine- a downright pleasure to use. The screen size also allows plenty of room to pull in the Mail app or Safari to grab bits of information, copy links, and do research for whatever I’m writing, which I think is the biggest reason that I like the 12.9″ model. I could go on with other ways that I use my iPad Pro, but that will keep for another day. I am more interested about what you, our readers, think about the 12.9″ iPad Pro. Do you have the big iPad Pro like me? If so, what has your experience been? Is there anyone who traded down to the 9.7″ model when it came out? If so, are you happy with your downsize? Are any of you strongly considering moving to the 10.5″ device, if it is more than just a rumor? Sometimes the 12.9″ iPad Pro feels like the odd man out device these days. With the iPad refresh rumors regularly repeating that an updated 12.9″ Pro is coming, I feel more confident that it is at least hanging on in Apple’s plans for now. However, I still wonder about its long term future, which is a big reason why I am interested in hearing what all of you out there think. Have an opinion on the 12.9″ iPad Pro? Please let us know in the Comments section below, on Flipboard, or on Twitter @iPadInsightBlog or @jhrogersii. We would love to hear from you. Previous PostThe Tech Press Was Half Right About the Next iPhone Having USB-CNext PostSize Matters- Who Prefers a Smaller iPad? I have a 12.9″ iPad Pro. My spouse has a 9.7″ Pro. I will only buy the 12.9″ as long as they make them. The 9.7″ now feels like a Mini in my hands. The size is what attracted to the Pro initially. I would be very disappointed if Apple discontinued the 12.9″ size. I’m with you on that one Chris. I will keep an open mind toward the 10.5″ if it does happen, but I don’t think I would be interested in a 9.7″ iPad again. I love my large iPad Pro for both work and pleasure. With the right set of apps, I can quickly address work-related things without having to wait for my laptop to boot up and also be able to switch back to watching my favorite streaming show or messaging with friends. It isn’t fully a laptop replacement…yet, but I didn’t really expect it to be — rather it enhances and streamlines my work and the increasing number of work-related apps that interface with traditional browsers allows me a (nearly) seamless transition to my traditional workstation at work. Alan, it sounds like you have some workflows that are similar to mine. And I absolutely agree with you that the iPad Pro isn’t a full laptop replacement, which is one reason I like the tone of Apple’s new commercials. It may not be able to do everything as well, but there are some tasks that it actually performs much better. I tend to focus on using it for those types of things. I’m a professional writer and artist wanna be. I use the 12.9 iPad for drawing with Procreate and Graphic. It’s also a backup for my Macbook2016 (m7), which is my main writing machine. The iPad 12.9 can run writing apps I use–Scrivener, Ulysses, and Google Docs. I use two different keyboards, a Bluetooth Brydge and a lightning-connector Logitech. I bought Apple’s keyboard, but I found it flimsy and buggy. I tried Duet and Astropad, but they don’t work for me. I used to own an iMac 27 for drawing with an intuos tablet, but I sold it. The iPad is so much better because of smoothness of operation, and for my purposes Procreate and Graphic are superior to Adobe’s Photoshop and Illustrator. I own the Apple Pencil, but rarely use it. I find that my finger is the best stylus. Pressure sensitivity is overrated as a feature. I love what Apple has done with Airdrop to easily move files back forth between the iPad and the Macbook. An unheralded strength of both the iPad and the Macbook for writing and drawing is that they stay cool. Thank you for writing your piece on the iPad and for the opportunity to get in my two cents worth. THANK YOU for responding, Ernest. I love hearing the perspective of an artist, since that is a specific target of iPad Pro. It’s interesting that you don’t prefer the Pencil, but to each their own, right? It’s cool that the Pro is flexible enough that tactile input still makes good sense for you. Even though we work in VERY different fields, it sounds like you are using your Pro and Mac together to accomplish various tasks, which is similar to what I do at work most days. I think the 12.9″ Pro is just such a great complimentary device for many work tasks that span across different fields and disciplines. Apple would do well to open more users’ eyes to this. I love my 12.9″ iPad Pro. I use for everything from drone contro to aviation software to navigation apps when sailing…it’s my top pic for as long as they make them. Scott- Those are really interesting use cases. Do you have the LTE model with GPS for navigation? Also, what kind of case are you using? It sounds like you have the Pro in some more challenging than average environments. I have an iPad pro, and I must admit it has replaced my Macbook Air. I use the iPad for college, and I have it equipped with an Apple keyboard. For a keybord that doubles as a slim case, it is amazing when you realize how portable and functional it really is. The keys feel great to the touch, and i have been able to write 10 page essays and even write code with it. The iPad pro is much more portable than a laptop. The iOS user interface also feels much more natural to me in todays mobile world. Perhaps Apple can make a touch-screen mac, but I do not think Apple will because MacOS isnt designed for touch. The iPad is quickly being able to do most tasks that any laptop can, and more. The one task that before seemed impossible to do on an iPad was coding and developing apps. However, with the intoduction of Swift playgrounds, Apple is making developing on an iPad possible. In my opinion a 9.7 inch iPad can not replace your laptop, but a 12.9 inch can. At this size it is basically the size of a macbook, but much more lighter, slimmer, and portable. 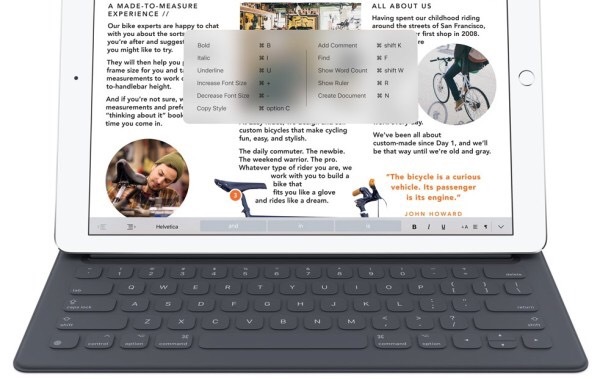 Apple, along with Microsft and Samsung, are making it clear that the trend for PC’s are these “hybrid tablets.” iPad will continue to improve, along with the iOS software, furthering the distance between what a tablet can do, and what a laptop can not. Jean- Wow. So the iPad has become a laptop replacement for you in many ways. I work in a specialized industry where ALL of the programming and engineering software is Windows based, so I have never had the option to go all-in on the iPad, even if I wanted to. For that reason, it’s great to hear from someone who can. Don’t jump on my next article too badly. It sounds like you and I have VASTLY different experiences with the Apple Smart Keyboard. I hate that thing with the fire of many suns and will be writing about it soon. I guess it’s good for Apple that some users like it. I was an iSkeptic when iPad debuted, and bought into that “consumption device” argument against it… until I actually used one. Now, iOS is my primary platform. Mac is still awesome, but in all honesty it is overkill for me now. Not all of us are coders or artists that require the kind of advantages it might offer. iOS’s streamlined operation has spoiled me. Jack- There are many users out there for whom the iPad can handle 90-100% of their computing tasks. My Mother In Law has run on an iPad 2 exclusively for a few years and loved it, and my Dad uses the combo of an iPad Mini and a Chromebook 99% of the time. Do you still have and use a Mac? If so, how do you split your usage time between the iPad and Mac? Just curious. I’ve been using my 12.9″ iPad Pro since it’s launch in late 2015. For the entire of 2016 and going into 2017, it is the only device that I bring into class for teaching. It’s large screen rail estate allows me to showcase my content teaching and another visual learning tool side by side very effectively. And using apps such as UPAD3, PDF Expert and Google Classroom, it has allowed me to build a teaching workflow based on the use of Apple Pencil on those apps that allow me to hand write notes for students. I look forward to the next generation 12.9″ iPad Pro. Colin- It’s good to hear from a teacher on this topic. I’ve always felt like the iPad was ideal in a lot of teaching situations. I lead a class on using smartphones and tablets for Bible study at my church using my iPad, AirPlaying to an Apple TV on a large television in the classroom. Part of that was proof of concept because of the subject of the class, but it was also just an easy way to run a class, and that was 3 years ago. With the Pencil and true multi-tasking, I’m sure it’s an even better experience now. I love the Pro’s. I love them so much that I have both the 12.9 and the 9.7. And I use them both all the time. The difference is that I carry the 9.7 around with me all the time and I mostly use the 12.9 at home. I love having them both and don’t consider either of them a waste at all. QGU- Now I’m jealous. All kidding aside though, that sounds like a great setup for those who can pull it off. If Apple comes out with a Mini Pro (which keeps drifting in and out of rumors as Apple’s next event approaches), I may get one for my wife and kids to use at home. I also use both my Pro’s as additional monitors with Duet. Also, I am vocal coordinator for our Praise Team at church. That means that I don’t print sheet music for our members and we all sing from our devices. Also, I make extensive arrangement notes using Apple Pencil that then my entire team can see as we practice. I couldn’t do without them. My laptop sits lonely and unused. QGU- That is a great way to use the iPad Pro to get your points across and share information with your performers. I use my iPad Pro 12.9 for a monitor at work using duet but also do amateur music production on it. The additional real-estate is really essential to many of the synth apps with smallish controls or virtual piano keyboards. Lots of iPad musicians are using the larger screen of the Pro – probably a niche use. Mike- Someone in the Flipboard comments also mentioned music as a great use case. I used to teach percussion privately, and teach drumlines and ensembles, myself. Unfortunately, this was most from the 90s to the early 2000s, so the iPad didn’t come soon enough for me. Boy I wish it had. I spent WAY to many hours scribbling out barely legible exercises and arrangements on staff paper. I can see where many different musical tasks would be great use cases for the larger screen. Like I said on Flipboard, I’be been out of the game too long for that to immediately come to mind anymore. My iPad Pro 12.9″ is the best computer I’ve owned. I’m an ad-man on Madison Avenue in NYC and need to turn work around quickly. Quality must be top notch and apps like Procreate, Sketchbook Pro, Adobe Comp and Pixelmator keep everything looking professional and slick. Of course I also use the iPad Pro for email, research, writing, spreadsheets and simply reading the news. My son uses his exclusively in college – he brought his MacBook Pro home because it sat unused. He takes his iPad Pro to class for note taking and studying. Everything is backed up safely to iCloud and Google Drive. It’s a wonderful device! Jefffeith- That’s cool that you can basically handle your entire workflow on the 12.9″ Pro. If you don’t mind me asking, do you use a case and/or keyboard, or do you stick to the on-screen keyboard for any typing you have to do? As for your son, I can absolutely see that. The combo of the iPad Pro, the Pencil and Notability is unparalleled as far as lecture/Meeting recording and note taking. I have recommended this setup SEVERAL times to people that have seen me using them during meetings, conferences, and training classes. I wish this had been around when I was in college. My son uses Notability and the Apple Pencil during class. Back in his dorm or at the library he uses the split screen feature to type up his notes into Pages. All of his reports and research are done in Pages and Numbers. Like me, he uses the Apple Bluetooth keyboard. Everything is kept in his backpack as he skateboards around campus. He prints via AirPrint to a community printer either in his dorm or the tech lab. He’s studying to become a doctor. I like keeping my IPad Pro separate from a keyboard because I’m constantly sketching and creating layouts. The keyboard stays at my desk but I’ve occasionally brought it into meetings. I have the heavy duty STM Dux Case (plus the Smart Cover) because I dropped (and cracked) my iPad Pro. With AppleCare, my 18 month old iPad Pro was covered! My MacBook Pro is barely used and my 27″ iMac is primarily a Photoshop machine. But I do not believe Photoshop is a necessity anymore and use the iMac as a courtesy to my company – who purchased it for me. Thanks for writing this! I feel the same exact way. Once I had my 12.9 Pro, my MacBook Air became practically obsolete. I struggled understanding in purchasing the MacBook Pro was worth it. It totally is, my workflow has separated in similar ways. The iPad Pro excels an media consumption, communication, and curating content for social media. My laptop is for deep work and is super compact, so I can take both devices where, and employ Duet when needed. SirZac- Thank you for reading and responding! It’s good to see so many shared experiences here. I really think Apple would be wise to acknowledge this dual use case you and I have, just as much as showing the Pro as a stand-alone device. I understand from several comments here that there are some professions where that really works, and that’s great. However, this is how the rest of us who have the Pros are using them. In my opinion, they would stand to sell more if they made potential users understand its value as a secondary computing device, as well. There’s no reason they can’t do both, other than arrogance. I’m a professional musician and instead of carting books I use my iPad, so I use it everyday and I LOVE it! I need it to be large enough to read full scores. Otherwise, I would be squinting my eyes all the time. I hope they continue making iPads this size with new futures. The 12.9 iPad Pro is the King of iPads ! It lifts the iPad from an entertaiment center to a device which can tackle serious business use. The split-screen function is brilliant – not really practical on smaller iPads. I use mine literally every day. Long may it continue, it is the iPad at its best. Before the rumors regarding the iPad I was dead set on buying the 12.9″ iPad, but if it’s just going to get a spec update it looks like i’ll be maxing out a 10.5″ iPad. I expect to have ALL the features of the smaller devices, if it can’t provide it I’ll go with the size that can. I immediately honed into this article, ironically reading it on my pro, and writing this, on my pro. I love mine. Main reason: I am far sighted. I need that extra screen real estate to read appropriately. I use a MBA 13″ at work and I do use Duet with my pro as a second screen. I hope and pray apple continues to make, produce and advance this line of iPads.